Swim with the Caribbean's most magnificent sea creatures the reef and nurse sharks. This two-tank dive is for anyone who loves adventure. On each Shark Adventure Dive, you will visit two of the four locations: The Arena and Shark Wall or The Runway and Runway Wall. Any one of these sites consistently attracts groups of sharks. During the day, nurse sharks hang together in groups of up to 40. At night, they swim off on their own in search of food. They like to stay close to the shore near the bottom of the ocean. In general, they are sluggish creatures. 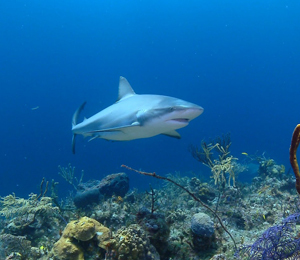 Measuring up to 10 feet long, the Caribbean reef shark is one of the largest predators in the reef ecosystem. They prefer shallow waters on or around coral reefs. They are normally shy or indifferent to the presence of people, but will come around when offered food by our professionally trained shark feeders. During the first dive, the sharks will take notice of you, and because of the close distance to feeding locations, they will even follow you around at a respectful distance as they anticipate being fed. During our second dive, you will actually witness a shark feeding. Divers will gather around in a semi-circle on the ocean floor in front of our professionally trained shark feeder. The shark feeder will have a bait box, which will encourage the sharks to join the group. The feeder will use a pole spear to release to the food safely and with control. The sharks may come very close, but they will be more interested in the food in the bait box than in any of our divers. I have been to the Bahamas many times, but Stuart Cove Shark Adventure Dive is one of my favorite trips! It includes everything that everyone should do here. As a Bahamas veteran, I can say only the best about this experience!